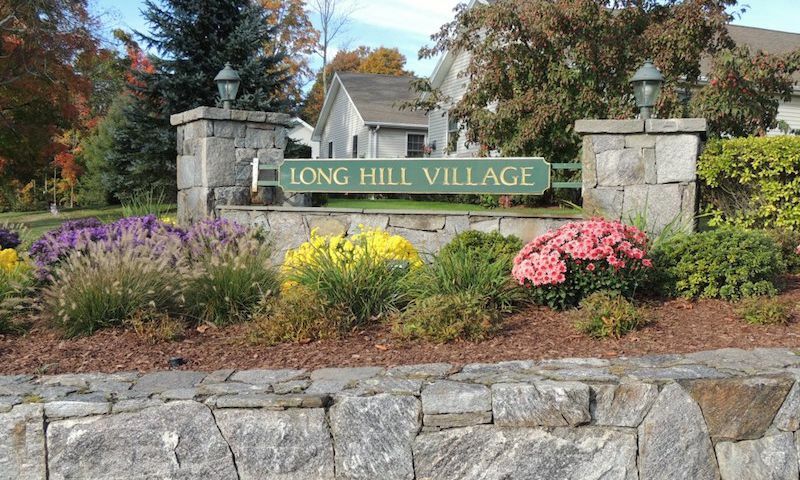 Long Hill Village is an active adult community in Trumbull, Connecticut. This neighborhood includes 71 attached homes and a clubhouse for events. Located adjacent to the Pequonnock River Valley, residents have miles of natural beauty and outdoor recreation in their backyard. Daily conveniences are within walking distance and the restaurants, shops, and beaches of Bridgeport are just a short drive away. A clubhouse features a multi-purpose room for residents to meet for activities or host social events. Trees and greenbelts throughout the community create a serene backdrop for picnics. The homeowners’ association provides grounds maintenance for these common areas as well as property management and insurance. With their homes looked after, residents can relax and spend more time meeting with friends, pursuing hobbies, or traveling. Construction in Long Hill Village began in 1997 and concluded in 1999 with 71 attached homes. These homes range in size from 1,070 to 1,400 square feet and have one or two bedrooms, one or two bathrooms, and an attached one-car garage. Features in some homes include stainless steel appliances, walk-in showers, and private decks. Long Hill Village is located right down the street from a library, restaurant, and supermarket. Adjacent to the community is the Pequonnock River Valley, a scenic, wooded area with granite rocks and cliffs. The Pequonnock River Trail cuts through this area as well as 16 miles of park space between Bridgeport and Monroe. Golfers have plenty of courses in the area to choose from, including Tasha Knolls & Tashua Glen Golf Course, Fairchild Wheeler Golf Course, and Whitney Farms Golf Course. Residents are only a 15-minute drive from the beach in Bridgeport. Active adults seeking a quiet 55+ community in a convenient location should check out Long Hill Village in Trumbull, CT. Check back soon for more information on the lifestyle in Long Hill Village. Construction in Long Hill Village began in 1997 and concluded in 1999 with 71 attached homes. These homes range in size from 1,070 to 1,400 square feet and have one or two bedrooms, one or two bathrooms, and an attached one-car garage. Features in some homes include stainless steel appliances, walk-in showers, and private decks. Please Note: Floor plans are not available at this time. 55places.com is not affiliated with the developer(s) or homeowners association of Long Hill Village. The information you submit is distributed to a 55places.com Partner Agent, who is a licensed real estate agent. The information regarding Long Hill Village has not been verified or approved by the developer or homeowners association. Please verify all information prior to purchasing. 55places.com is not responsible for any errors regarding the information displayed on this website.